Bill Borland purchased the Nevada & DieCard molds about 1991. He then proceeded to have the following chips made for him by Atlantic Standard in order that he could sell them as commemorative chips in his store for $1 each. Bill had a live in, named Starr Warwick, who did all of his bookkeeping and all the research and typing of his 'Blue Book of Casino Chips'. Starr died just before this time and Bill had the first five sets made as a memorial to her. After the first five sets were made, Borland sent a frame, in the shape of a map of Nevada, to Jim Blanchard at Atlantic Standard. A photograph, together with a copy of the front and back of Borland's original advert display board for these chips is shown at the very bottom of this article. 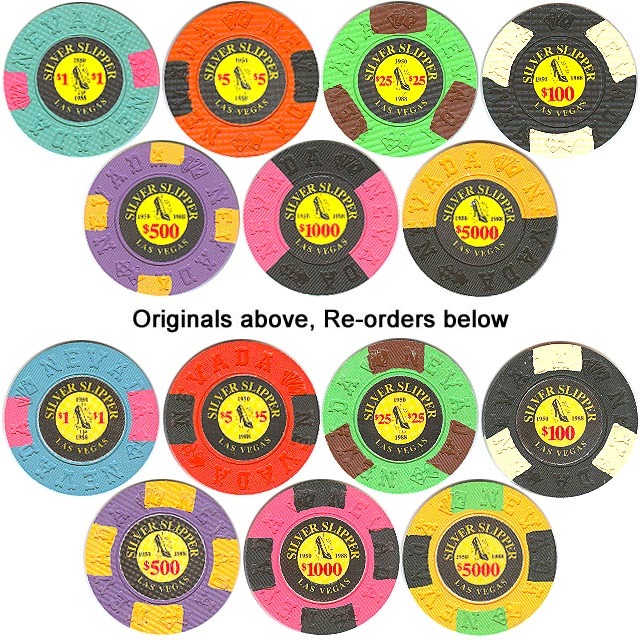 The chips were not made with the intention of mis-leading collectors although this has happened in latter times due to inadequate or incorrect descriptions on ebay and unscrupulous dealers. None of these chips were ever in play or designed to be in play at any casino. 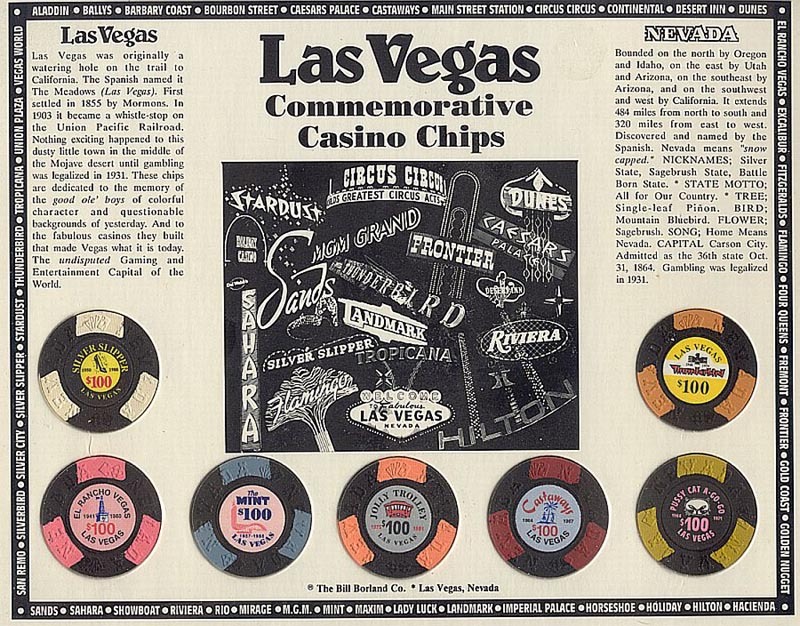 The inlays of the chips bear a resemblance to some original chips. In addition they bear the opening and closing dates of those casinos. Jim Blanchard insisted he would not make the chips without these dates. 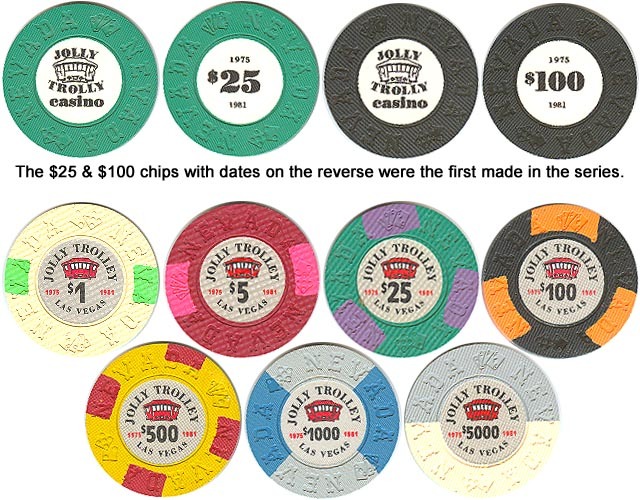 Per the manufacturing records, the first of these commemorative chips Borland had made were the mis-spelt Jolly Trolly $25 & $100, with denoms in reverse. Presumably these were some sort of prototype/sample and only 100 each were made. He then went on to order 49 'fantasy' chips. 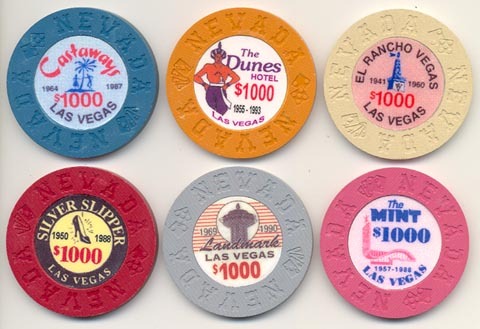 7 casinos (Castaways, El Rancho, Jolly Trolley, Mint, Pussycat A Go Go, Silver Slipper and Thunderbird) all had a series of 7 denominations from $1 to $5000. These intitial 7 series all have the same edge spot designs - $1 have 2 x 3/8" inserts, $5 = 2 x 1/2", $25 = 3 x 9/16", $100 = 2 x 5/8", $500 = 4 x 3/8", $1000 = 1/4 pie, $5000 = 1/2 pie. From the original orders also comes the $1 Mint in black, of which only a few are known, most likely a result of ASM having insufficient die to complete the order. Borland didnt care about the colors or edge spot patterns, he just wanted chips to sell and fast. 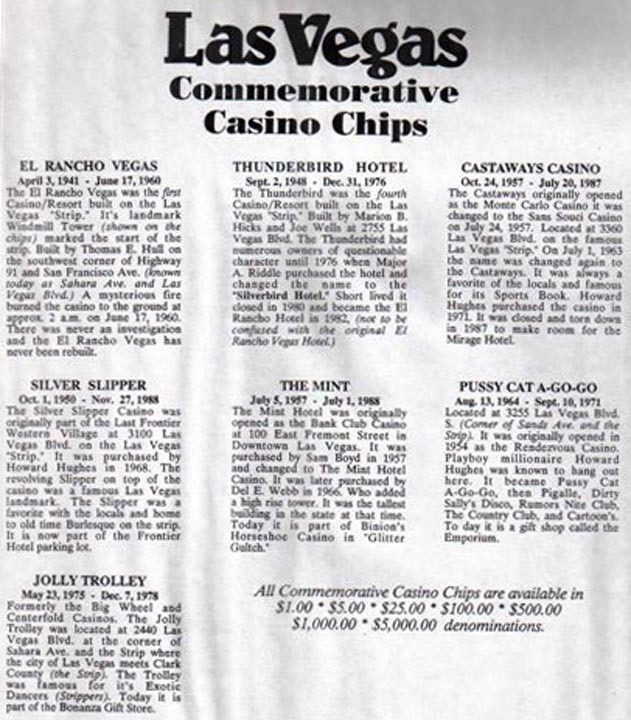 Subsequently, Borland re-ordered chips from 5 of the original 7 series (El Rancho, Mint, Pussycat A Go Go, Silver Slipper, Thunderbird) and also added 3 new casinos (Dunes, Landmark, Marina). ASM had originally quoted Borland a low price for the commemorative chips, unaware of the volume that would be ordered. 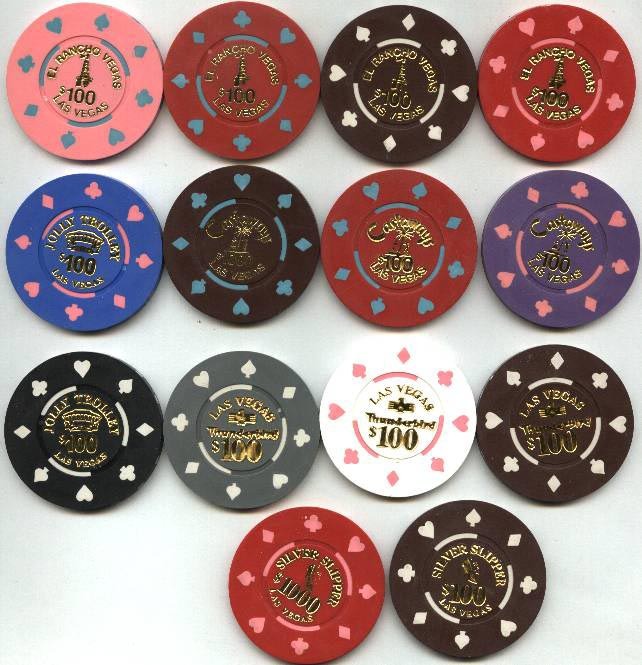 In order to reduce production costs, the inserts were standardised for these re-orders and new casinos, such that every chip would have 1/2" inserts only. 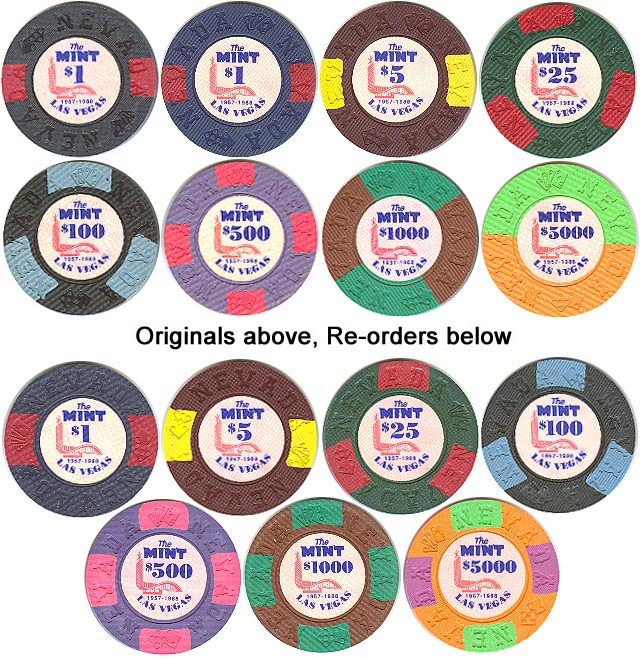 In some cases, as can be seen below, there is a slight difference in chip color between the orders. This is only significant for the five $5 chips that were re-ordered, as both issues had 1/2" inserts. All the chips below were scanned at the same time so whilst their colors may not be 100% accurate, the comparisons should be adequate. On some later orders, the apparent reduction or absence of 'brass flecks' (weighting) was nothing to do with a reduction in production cost (non-weighted chips actually cost more to produce) but merely the effect of using a different color of weight as ASM had run out of the original color and Borland did not want to wait. These later orders thus yielded a further 57 different chips, making 108 varieties in total. Subsequently some reproductions (in differing qualities) have also appeared and some of these are shown at the bottom of the article along with other 'fantasy' chips Borland hot-stamped onto a suits mold. All Borland's chips have cross hatching on the inlays. 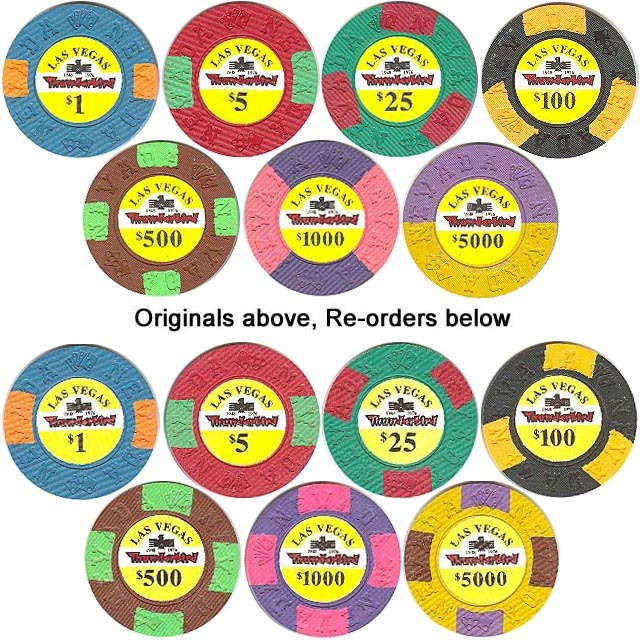 Where found, I have included order dates and quantities for the chips although some still need further verification and there may be missing orders. 15 El Rancho Vegas $1.00 1941-1960 N5941 navy 2 mustard (3/8") 1500 2/23/92? 15a El Rancho Vegas $1.00 1941-1960 N5941 navy 2 mustard (1/2") 2000 10/15/95? 16 El Rancho Vegas $5.00 1941-1960 N5945 hot pink 2 purple (1/2") 1500 2/23/92? 16a El Rancho Vegas $5.00 1941-1960 N5945 hot pink 2 purple (1/2") 2000 10/15/95? 17 El Rancho Vegas $25.00 1941-1960 N5998 green 3 yellow (9/16") 1500 2/23/92? 17a El Rancho Vegas $25.00 1941-1960 N5998 green 3 yellow (1/2") 2000 10/15/95? 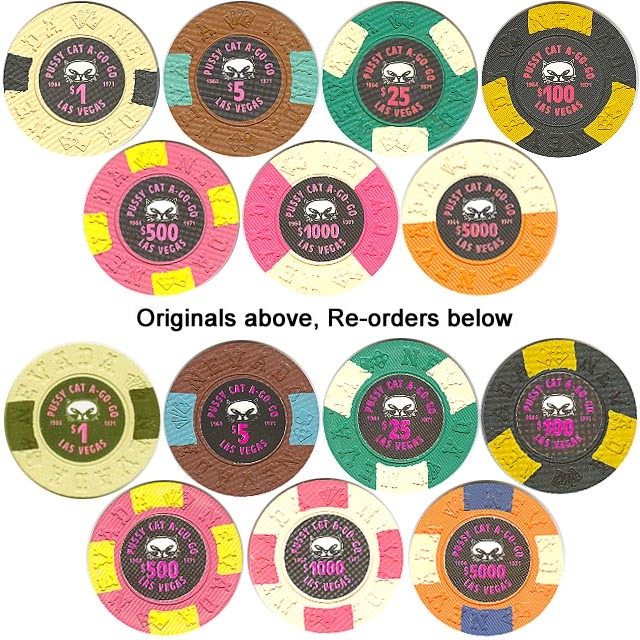 18 El Rancho Vegas $100.00 1941-1960 N5987 black 3 pink (5/8") 1500 2/23/92? 18a El Rancho Vegas $100.00 1941-1960 N5987 black 3 pink (1/2") 2000 10/15/95? 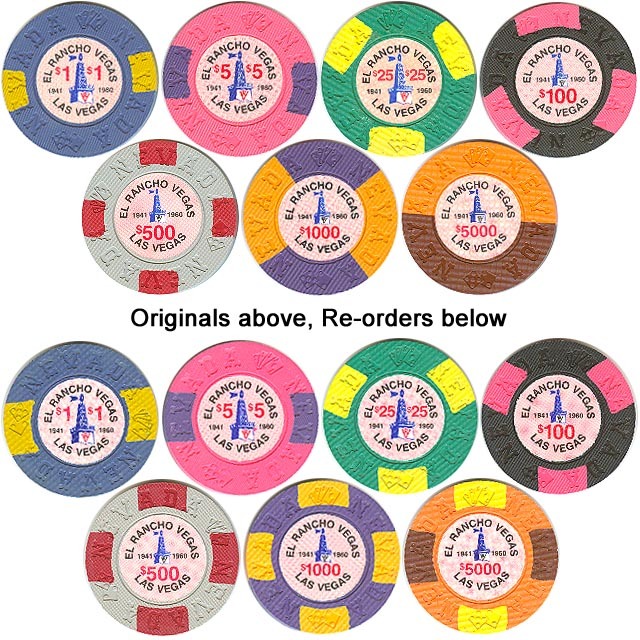 19 El Rancho Vegas $500.00 1941-1960 N6011 gray 4 red (3/8") 1000 2/23/92? 19a El Rancho Vegas $500.00 1941-1960 N6011 gray 4 red (1/2") 2000 10/15/95? 20 El Rancho Vegas $1,000.00 1941-1960 V2364 purple 4 ochre (1/2") 2000 10/15/95? 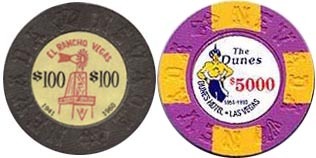 21 El Rancho Vegas $1,000.00 1941-1960 N6143 ochre, purple 2 ochre, 2 purple 1/4 pie 1000 2/23/92? 22 El Rancho Vegas $5,000.00 1941-1960 V2365 orange 2 yellow/2 brown (1/2") 2000 10/15/95? 23 El Rancho Vegas $5,000.00 1941-1960 N6024 orange, brown 1 orange, 1 brown 1/2 pie 1000 2/23/92? 24 Jolly Trolley $1.00 1975-1981 N5939 cream 2 green 300 2/23/92? 25 Jolly Trolley $5.00 1975-1981 N5943 dk red 2 pink 300 2/23/92? 26 Jolly Trolley $25.00 1975-1981 N5974 green 3 purple 500 2/23/92? 27 Jolly Trolley $25.00 1975-1981 N6097 green none 100 1/27/92? 28 Jolly Trolley $100.00 1975-1981 N5982 black 3 orange 500 2/23/92? 29 Jolly Trolley $100.00 1975-1981 N6035 black none 100 1/27/92? 30 Jolly Trolley $500.00 1975-1981 N6004 mustard 4 maroon 300 2/23/92? 31 Jolly Trolley $1,000.00 1975-1981 N6027 gray, blue 2 gray, 2 blue 1/4 pie 300 2/23/92? 32 Jolly Trolley $5,000.00 1975-1981 N6029 gray, white 1 gray, 1 white 1/2 pie 300 2/23/92? 47 Mint $1.00 1957-1988 E3617 black 2 dk red (3/8") 100? 2/23/92? 47a Mint $1.00 1957-1988 N5937 navy 2 dk red (1/2") 2000 3/6/95? 47b Mint $1.00 1957-1988 N5937 navy 2 dk red (3/8") 900? 2/23/92? 48 Mint $5.00 1957-1988 N5951 brown 2 yellow (1/2") 1000 2/23/92? 48a Mint $5.00 1957-1988 N5951 brown 2 yellow (1/2") 2000 3/6/95? 49 Mint $25.00 1957-1988 N5966 dk green 3 dk red (9/16") 1000 2/23/92? 49a Mint $25.00 1957-1988 N5966 dk green 3 dk red (1/2") 2000 3/6/95? 50 Mint $100.00 1957-1988 N5967 black 3 blue (5/8") 1500 2/23/92? 50a Mint $100.00 1957-1988 N5967 black 3 blue (1/2") 2000 3/6/95? 51 Mint $500.00 1957-1988 N6002 purple 4 dk pink (3/8") 1500 2/23/92? 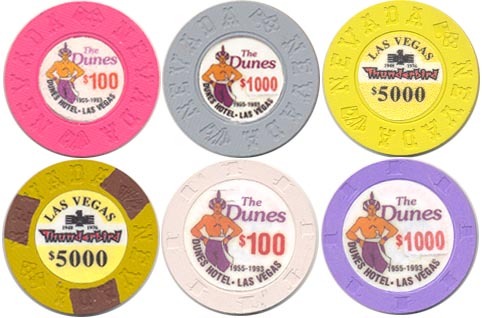 51a Mint $500.00 1957-1988 N6002 purple 4 dk pink (1/2") 2000 3/6/95? 52 Mint $1,000.00 1957-1988 V3070 brown 4 green (1/2") 2000 3/6/95? 53 Mint $1,000.00 1957-1988 N6022 brown, green 2 brown, 2 green 1/4 pie 1500 2/23/92? 54 Mint $5,000.00 1957-1988 E1544 orange 2 green/2 purple (1/2") 2000 3/6/95? 55 Mint $5,000.00 1957-1988 N6146 orange, green 1 orange, 1 green 1/2 pie 1000 2/23/92? 56 Pussycat a'Go Go $1.00 1964-1971 N5934 cream 2 black (3/8") 300 2/23/92? 56a Pussycat a'Go Go $1.00 1964-1971 N5934 cream 2 black (1/2") 2000 3/6/95? 57 Pussycat a'Go Go $5.00 1964-1971 N5948 brown 2 turquoise (1/2") 300 2/23/92? 57a Pussycat a'Go Go $5.00 1964-1971 N5948 brown 2 turquoise (1/2") 2000 3/6/95? 58 Pussycat a'Go Go $25.00 1964-1971 N5995 green 3 white (9/16") 300 2/23/92? 58a Pussycat a'Go Go $25.00 1964-1971 N5995 green 3 white (1/2") 2000 3/6/95? 59 Pussycat a'Go Go $100.00 1964-1971 N5976 black 3 mustard (5/8") 300 2/23/92? 59a Pussycat a'Go Go $100.00 1964-1971 N5976 black 3 mustard (1/2") 2000 3/6/95? 60 Pussycat a'Go Go $500.00 1964-1971 N6014 dk pink 4 yellow (3/8") 300 2/23/92? 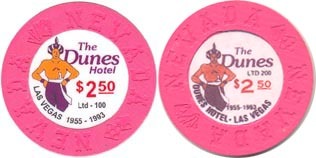 60a Pussycat a'Go Go $500.00 1964-1971 N6014 dk pink 4 yellow (1/2") 2000 3/6/95? 61 Pussycat a'Go Go $1,000.00 1964-1971 V3235 white 4 pink (1/2") 2000 3/6/95? 62 Pussycat a'Go Go $1,000.00 1964-1971 N5950 pink, white 2 pink, 2 white 1/4 pie 300 2/23/92? 63 Pussycat a'Go Go $5,000.00 1964-1971 E2173 orange 2 cream/2 navy (1/2") 2000 3/6/95? 64 Pussycat a'Go Go $5,000.00 1964-1971 N6026 white, orange 1 white, 1 orange 1/2 pie 300 2/23/92? 65 Silver Slipper $1.00 1950-1988 N5944 turquoise 2 pink (3/8") 1500 2/23/92? 65a Silver Slipper $1.00 1950-1988 N5944 blue 2 pink (1/2") 2000 6/13/95? 66 Silver Slipper $5.00 1950-1988 N5933 rust 2 black (1/2") 1500 2/23/92? 66a Silver Slipper $5.00 1950-1988 N5933 rust 2 black (1/2") 2000 6/13/95? 67 Silver Slipper $25.00 1950-1988 N5961 green 3 brown (9/16") 1500 2/23/92? 67a Silver Slipper $25.00 1950-1988 N5961 green 3 brown (1/2") 2000 6/13/95? 68 Silver Slipper $100.00 1950-1988 N5962 black 3 white (5/8") 1500 2/23/92? 68a Silver Slipper $100.00 1950-1988 N5962 black 3 white (1/2") 2000 6/13/95? 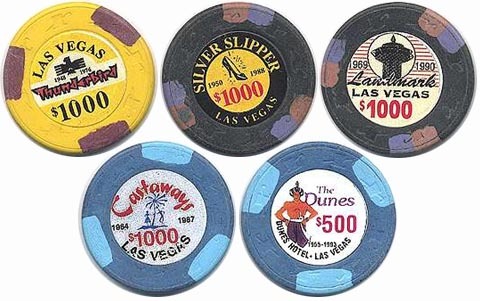 69 Silver Slipper $500.00 1950-1988 N6008 purple 4 orange (3/8") 1500 2/23/92? 69a Silver Slipper $500.00 1950-1988 N6008 purple 4 orange (1/2") 2000 6/13/95? 70 Silver Slipper $1,000.00 1950-1988 E2544 pink 4 black (1/2") 2000 6/13/95? 71 Silver Slipper $1,000.00 1950-1988 N5935 black, pink 2 black, 2 pink 1/4 pie 1500 2/23/92? 72 Silver Slipper $5,000.00 1950-1988 E2545 mustard 2 black, 2 green (1/2") 2000 6/13/95? 73 Silver Slipper $5,000.00 1950-1988 N6023 black, mustard 1 black, 1 mustard 1/2 pie 1500 2/23/92? 74 Thunderbird $1.00 1948-1976 N5942 aqua 2 orange (3/8") 1500 2/23/92? 74a Thunderbird $1.00 1948-1976 N5942 aqua 2 orange (1/2") 2000 6/13/95? 75 Thunderbird $5.00 1948-1976 N5938 red 2 green (1/2") 2000 2/23/92? 75a Thunderbird $5.00 1948-1976 N5938 red 2 green (1/2") 2000 6/13/95? 76 Thunderbird $25.00 1948-1976 N5992 green 3 red (9/16") 1500 2/23/92? 76a Thunderbird $25.00 1948-1976 N5992 green 3 red (1/2") 2000 6/13/95? 77 Thunderbird $100.00 1948-1976 N5981 black 3 orange (5/8") 2000 2/23/92? 77a Thunderbird $100.00 1948-1976 N5981 black 3 orange (1/2") 2000 6/13/95? 78 Thunderbird $500.00 1948-1976 N6003 brown 4 green (3/8") 1500 2/23/92? 78a Thunderbird $500.00 1948-1976 N6003 brown 4 green (1/2") 2000 6/13/95? 79 Thunderbird $1,000.00 1948-1976 E2788 purple 4 pink (1/2") 2000 6/13/95? 80 Thunderbird $1,000.00 1948-1976 N6148 pink, purple 2 pink, 2 purple 1/4 pie 1500 2/23/92? 81 Thunderbird $5,000.00 1948-1976 E2790 mustard 2 brown/2 purple (1/2") 2000 6/13/95? 82 Thunderbird $5,000.00 1948-1976 N6028 mustard, purple 1 mustard, 1 purple 1/2 pie 1500 2/23/92? 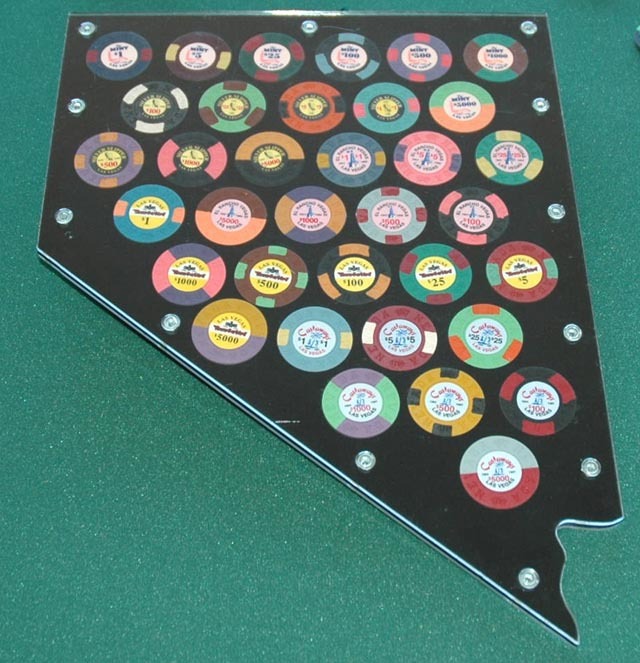 Almost certainly produced before the fantasy chips which this article focuses on, Bill Borland made a number or similar, possibly prototype chips, on a 'suits' mold believed to be from RT plastics (pic courtesy of Gene Trimble). When they were working together, Dave Whalen and Bill Eichorn made a number of chips resembling the originals when Whalen was practicing the repair of chips. About 6 of each of the examples below are thought to have been made. They exist with various degrees of cross hatching (or none) on the inlays while Whalen was perfecting the technique. They may have copied others as well. Subsequently, Dave Whalen alone made these 2 additional examples 3 Landmarks exist and the El Rancho is believed to be one of a kind (pic courtesy of Gene Trimble). 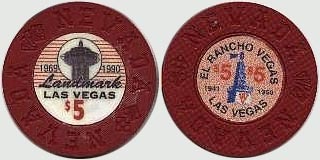 The following El Rancho chip was made by Bill Eichorn. It is possible he made the two known examples of the $5000 Dunes 'yellow shirt' as well - they are not Borlands. The chip below appeared for sale on ebay at the end of 2004. It has no cross-hatching. It was apparently made by applying a sticker over the top of another design. A number of these were made by Sam Heppler, a colleague of Dave Whalen. Some are marked 'Ltd - 100' and some are marked 'Ltd - 200' with slightly different design. While Whalen was 'teaching' Heppler, the 6 chips shown below (probably one-offs) were also made. Two are on hat & cane blanks and the 3 chips on NEVADA mold with no inserts have inlays on one side only (reverse is blank). Front & Back of Borland's original advert board. Framed set of the first 35 chips. Thanks to those who contributed to this article (in addition to those already named) go to Jim Blanchard, Jay Sands, Rick Miner, Allan Myers, Kenny Francis and Steve Wilson.